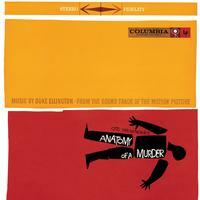 Duke Ellington's original soundtrack to Otto Preminger's 1959 classic courtroom drama, "Anatomy Of A Murder," called "the best trial movie of all time," and based on a best-selling novel written by Robert Traver (aka Supreme Court Justice John D. Voelker who based the book on a 1952 murder case). Although this was not Ellington's first film score, it was his first score for a major all-star motion picture. The film stars Jimmy Stewart, George C. Scott, Lee Remick, Ben Gazzara, and Arthur O'Connell and features Ellington himself, playing a character named "Pie-Eye." Like all soundtracks, Ellington's focus here is to punctuate the action of the film, but nonetheless many of the tracks, particularly "Flirtibird" (featuring alto sax player Johnny Hodges), "Happy Anatomy" (featuring trumpet player Clark Terry and tenor sax player Paul Gonsalves) and "Midnight Indigo" stand well alongside Ellington's other music from this period.